I’m beginning this blog for a number of reasons. But mainly, what I’m going to do is to write about new recipes, and review them – every week. 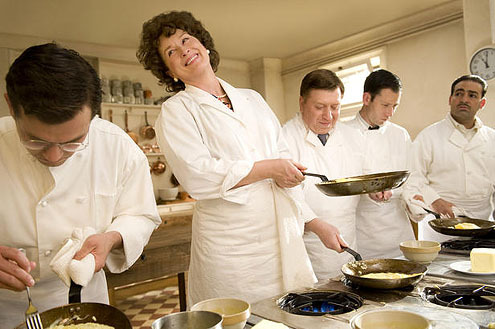 I’ve been inspired, recently, by watching the movie, “Julie and Julia”. If you haven’t seen this, and you love to cook – it’s a must. Not only did I love the movie for its content – the loosely depicted biography of Julia Child, Meryl Streep in all her glory, humor throughout – but I so strongly identified with Amy Adams’ character Julie, who blogged about her culinary journey, that I was compelled to do something similar. The French cultural reference is also near and dear to me, since I’m married to a French native who appreciates all my kitchen adventures. But I’m not here to blog solely about French food – that’s much too limiting for me. Like the character Julie in the movie – I, too, never seem to finish anything significant. I have a happy marriage, two beautiful boys, and I work at home. Before that, I had relative success with mid-level careers. Those are the long term things. But I’ve also attempted writing a low-carb cookbook, a custom recipe-creating service, a parents’ website, a free-lance writing career – all of which I didn’t complete, or haven’t been consistent about. Life is crazy for my little Midwestern family. The economy is in the crapper, our business income has declined, healthcare costs are unmanageable, and, like a lot of parents, I’ve been trying to find the perfect part-time job that will accommodate my family lifestyle. I’ve diagnosed myself with adult ADD, and in my constantly sidetracked, overwhelmed perfectionist state of mind, the only thing I seem to be able to focus on is a short term task. Our life is very stressful right now. I’m just trying to get through the day. Every few months I say to myself, “what do I want to be when I grow up?” I still don’t know the answer. There is one thing that I am consistent about throughout life: COOKING SOMETHING NEW. And so, for now, I can write about what I love, and maybe some readers will enjoy it. Perhaps I can inspire you to try something new and break out of your ‘Wednesday is spaghetti night’ habit. Or maybe, a reader will even challenge me. Weekly recipe rotation is non-existent in my home. And, even the family standbys are re-worked, revised, or improved every time I make them. Come and take a culinary journey with me! Every week will be a new adventure. I’ll try recipes from books, magazines, websites, my family, well-known chefs, and myself. This is meant to be fun, but I’ll give you the truth, no matter what. That may include ripping an occasionally recipe to shreds, if it’s deserved. But for the most part, you can count on reading about something great to make – with a few hints or tweaks from me to make things easier or better than what is written! Loved it!! I cant wait to read your weekly posts. You write so well with a lot of heart and soul. Keep it up because I will be a devoted reader. Enter your email address to receive my new recipes and cooking posts by email. Recipe Reporter · Welcome to my culinary den, where I try a recipe and tell you all about it. I'll tell you if you should waste your time, how to make it better, and when you should invite the neighborhood over for dinner.